The funeral has taken place of a long-serving Alliance councillor in Belfast – described as a “father figure” by colleagues – who passed away suddenly last week. Belfast city councillor Mervyn Jones – who had been a councillor for about 28 years – was found dead in his home by party colleagues after he failed to turn up to a council meeting on Thursday (June 1). His funeral was held at Roselawn Cemetery at 4pm on Tuesday. Shortly beforehand, a special meeting of Belfast City Council was held where warm tributes were paid to councillor Jones by his colleagues. 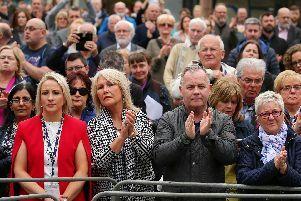 The Lord Mayor of Belfast, Alliance councillor Nuala McAllister, was appointed to her position on the night of Mervyn Jones’s passing. Clearly emotional, she said: “Mervyn was not only a councillor but he was our dear friend. “I owe personal gratitude to Mervyn, who was very protective of us. He was like a father to us. She continued: “Mervyn was absolutely, completely and utterly devoted to equality. “He might not have shouted it from the rooftops but that was the embodiment of Alliance; it was Mervyn. Michael Long, also a Belfast Alliance councillor (and husband of its leader Naomi), said: “Mervyn hadn’t been in great health for a number of years but I think everybody is utterly shocked and I know as a party group we are all still very shell-shocked about what has happened. Councillor Long spoke at length about his colleague’s diligence, work ethic, wit and “quirky” sense of humour. He also spoke warmly about councillor Jones’ love of football and his support for Sunderland, Glentoran and Northern Ireland. Councillor Jones was described as a family man who loved his children deeply. There were also tributes from those outside the Alliance Party. Veteran UUP councillor Jim Rodgers said: “I’ve known Mervyn quite a number of years. Mervyn served under my chairmanship in the Northern Ireland Local Government Audit Committee and he was a very diligent and active member.